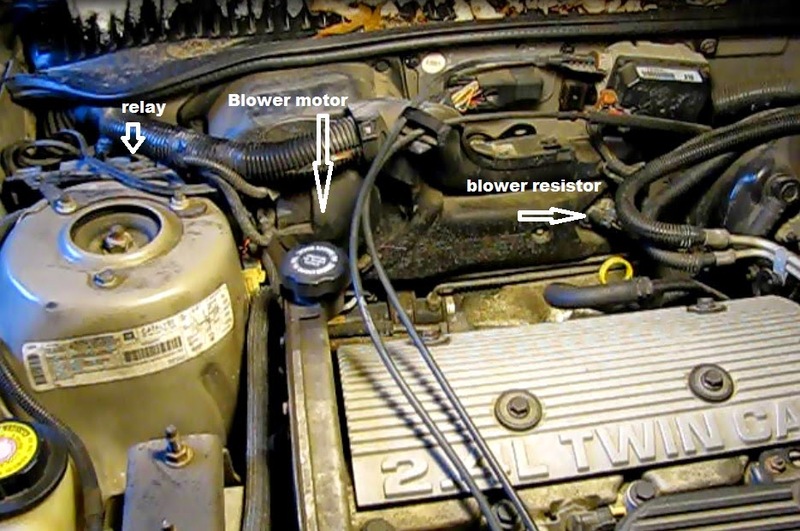 The blower motor in my 1997 Pontiac Grand Am suddenly stopped running at any of the four speeds. I pulled open the HVAC schematic in my Haynes manual and began to troubleshoot the problem. There are a number of possible causes for a blower failure. The blower motor, the blower motor resistor, the fuse for the circuit, the blower relay or the wiring could be the fault. 1) First check the fuse. In this car the fuse box is at the left end of the instrument panel, adjacent the driver side door. The 25 amp fuse was good. 2) Could it be the blower motor resistor? Located in the plastic HVAC housing in the middle of the firewall, the resistor is responsible for providing the three lower motor speeds and is an unlikely suspect because the fan won’t run at any speed. There is a separate circuit, operating through the blower relay and a fusible link, that operates only on the high speed fan control setting. What are the chances both circuits are bad? If the fan runs on high speed only, the blower motor resistor is likely the problem..
3) The blower relay is not likely to be the problem. At the three lower fan speeds the power for the motor simply runs through a normally closed contact. At high speed the relay is energized and switches contacts to provide full battery power through a fusible link. Both relay contacts would have to bad, a nearly impossible scenario. 4) Wiring. A good way to check the wiring is to disconnect the motor and connect a DC voltmeter to the end of the motor wires. Turn the fan on and check for power at the end of the wires. I did and got 11.5v at the end of the wires. The blower motor is bad. The motor is located inside a large black plastic housing mounted on the firewall. Removing this entire housing is not an option. GM has provided a recessed line in the plastic cover as a cutting guide. 1) Unplug the motor. there are two wires plugged into it, a ground and 12V power. 2) Disconnect the battery. All this cutting with various Exacto and utility knives and long bladed knives opens the possibly of nicking a live wire. 3) Pry out two panel fasteners securing the large wiring harness atop the housing. Move it up and as far out of the way as possible. I wedged a crowbar under the harness to provide access for cutting tools. 4) Cut away the entire cover, all the way around, following GM's guide line in the plastic. Remove one screw in the cover. Instructions call for leaving the lower two inches of the plastic intact, but on this car the motor could not be pulled out because this wide and hard piece affords no room. That may not be the case on every GM car. I used an 4 inch blade to painstakingly cut the lower several inches of the cover. As you work around be careful at the bottom not to cut too deep and nick the cooling hose going into the blower. Remove this hose as it becomes possible and tuck it out of harm’s way as the cutting continues. Remove insulation. 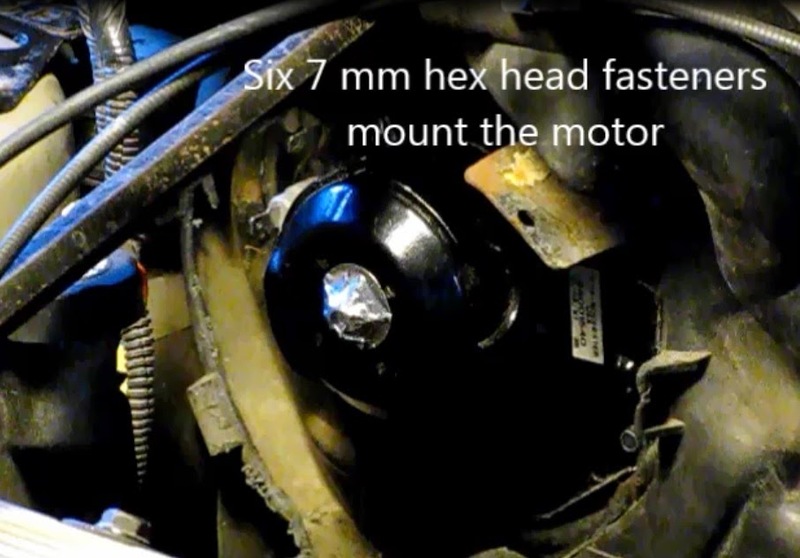 5) Remove the six 7 mm hex screws holding the motor in place. The upper right one also holds a wiring harness bracket. The cutting at the bottom is particularly difficult and requires a longer knife blade and takes time. 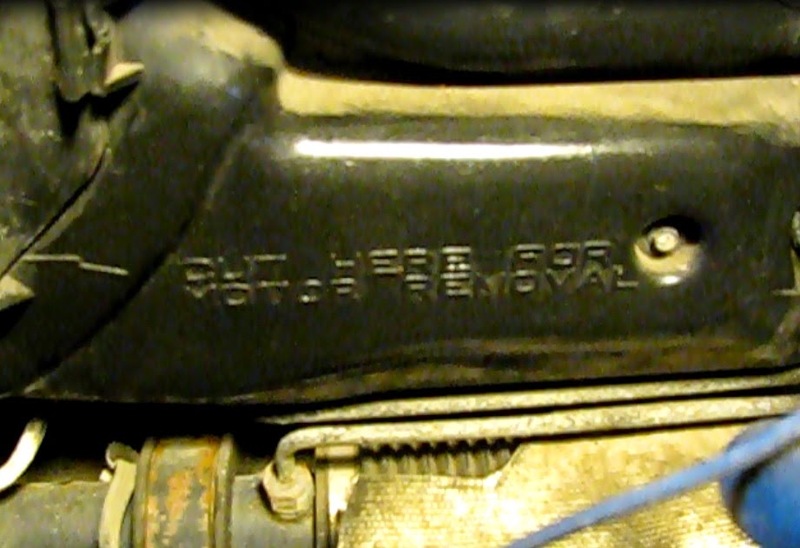 6) Pull out the blower motor. 1) Transfer the ground lug to the new motor. This is a good time to clean the contact surfaces of the electrical connections with a file or abrasive. 2) Put the motor in position and fasten down with the six 7mm hex head screws. 3) This would be a good time to test the motor. Plug it in temporarily and run it. It’s good! 4) Unplug it again and put the insulation back inside the cover. 5) Put the cover back in position and affix the one hold down screw that goes into a recessed part of the molded cover. Plug the motor wiring back in. 6) Press the cover back in cleanly all the way around. 7) Put down a bead of silicone over the cut seam all the way around. 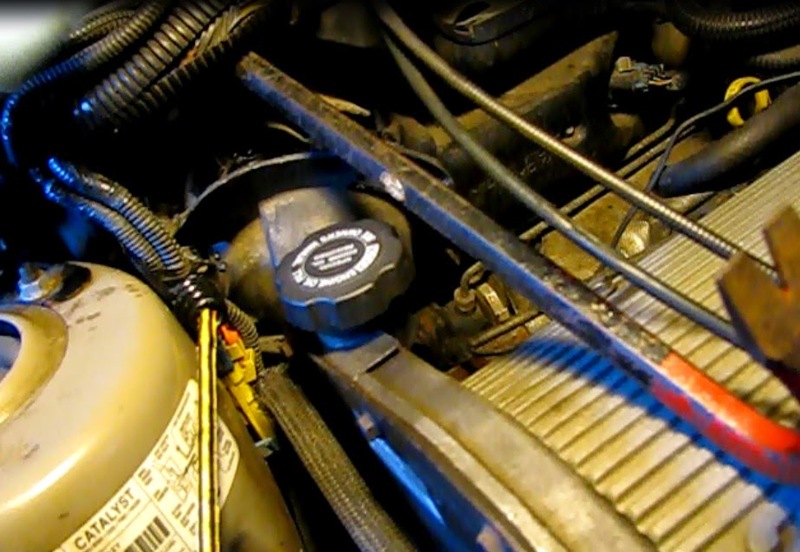 8) Redress the wires and wiring harness properly. Sorry, I'm not familiar with the air door actuator.